The earphones are equipped with a 10mm driver and a tangle-free wire. The Roadster Car Charger supports Qualcomm Quick Charge 3.0. 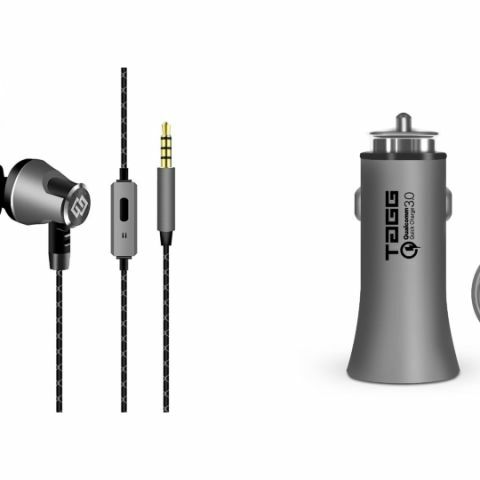 TAGG has launched its latest Metal Earphones and Roadster Car Charger, both priced at Rs 999. The earphone features a 10mm driver and is equipped with a 1.5m long tangle-free wire. The car charger supports Qualcomm Quick Charge 3.0 and is capable of delivering 3.0A. Both the devices can be purchased from the company's website and via Amazon and Flipkart as well. TAGG Digital, a leading Indian electronic gadget brand announces the launch of its first-ever metallic range of accessories. Under the current range, the brand has introduced metal body car charger-Roadster and earphones-Metal. TAGG Metal earphones provide a fantastic listening experience to the users and come with a 1.5 metre long, steady & tangle-free wire and snake braided cable. Its stylish and durable design ensures that the earphones always stays in place while running, jogging and gyming. The powerful nano-coating technology used in the earphones protects earbuds against sweat during the workout. The earphones encompass noise-cancelling microphone that helps users with trouble-free receiving of calls and undeterred sessions of musical extravaganza. The lightweight, compact and aluminum body earphones are also equipped with 10 mm drivers for HD sound while the super extra bass lets you enjoy your favorite songs with better clarity. TAGG roadster car charger is equipped with the latest Qualcomm 3.0 Quick Charge technology and is four times faster than the standard chargers. With a sleek and a compact design, the charger consists of two USB ports and an LED light for after dark. The charger comes with multiple built-in safeguards to protect the devices against excessive current, overheating, and overcharging. Equipped with one of the latest and most efficient USB charging technology, TAGG Roadster car charger can charge compatible devices to 80% in just 35 minutes. Speaking on the launch, Amitesh Bhardwaj, Co-Founder of TAGG Digital, said, "Our metallic range is an ideal combination of functionality and style. It would definitely be a perfect pick for tech enthusiasts who are looking for premium and stylish looking gizmos at value price points. The sleek design, metallic finish and advanced technology put TAGG metal earphones and car charger a notch higher in the market." Priced competitively at just Rs 999 each, the charger and earphones can be purchased from TAGG Digital Website and e-commerce platform-Amazon and Flipkart.